As Labor Commissioner, Julian Alvarez represents the interests of more than 13 million Texas workers with respect to TWC services and ensures that their concerns are considered in all Commission actions. Prior to his appointment, Commissioner Alvarez served as president and CEO of the Rio Grande Valley Partnership fostering relationships and coordinating programs to advance regional economic development and employment opportunities. He also served as a Texas regional director for the U.S. Senator Kay Bailey Hutchinson advising on legislative and policy issues related to South Texas. Prior to that, Alvarez served on the South Texas Drug Task Force as a state trooper for the Texas Department of Public Safety (DPS). After his service with DPS, Alvarez inspired stewardship and leadership as the director of college information for Texas State Technical College in Harlingen. Gulf Coast Concrete & Shell, Inc. If you are a member, but do not know your login information, please contact us so that we can help set up your online account so that you can recieve your $5 ticket discount! 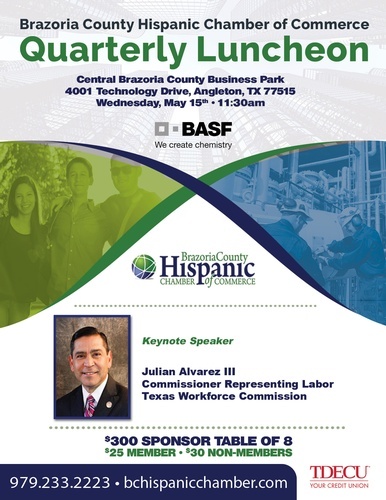 You can reach us by phone at 979-233-2223 or by email at gaguirre@bchispanicchamber.com.